To answer the many questions I've received about the The Jesus Record, I've compiled this FAQ - Frequently Asked Questions - document (similar to the Canticle FAQ). Some of the following info has already appeared in previous posts, but this is an attempt to create a centralized document for all relative information that will be updated as new information becomes available. Q: What is the The Jesus Record? A: I first heard of this project in May '97 while visiting with Mark Robertson about This Train and the Canticle Of The Plains (see [RichMailList 133]). During that conversation Mark told me that Rich was very excited about what was going to be his next album, but at that time there wasn't any "for-public-knowledge" info to share. Every song would be specifically about Jesus, and for the most part, straight from scripture. Originally Rich wanted all the Ragamuffins to write a song to bring to the project and also sing their own songs, but they convinced him that people wanted to hear him sing on a "Rich Mullins" album, not the Ragamuffins. Some of the songs that were to be on this new project were included in the summer '97 tour that they were in Wichita to rehearse. Fast forward to September 1997. The week before Rich died, he was in Chicago at the Roswell East Studio with Mark Robertson and Mitch McVicker and a few other Ragamuffins recording Mitch's solo CD. After one particular vocal recording session, Mark had one of the really nice microphones setup already, and asked Rich if he wanted to use that mic to record a demo tape that he had decided to prepare for Myrrh Records. Rich decided, no, he would just sit down in an abandoned nearby church with a cheap cassette recorder (he had just purchased at K-Mart to replace his broken one) and record the nine songs he had ready. Then came the tragic event that changed the course of several lives. Following the accident, Myrrh Records, Kid Brothers, and the Ragamuffins (Rick Elias [who had already been chosen to produce what had now become known as Ten Songs For Jesus], Mark Robertson, Jimmy Abegg, and Aaron Smith) decided this music still needed to happen. There you have a brief history of how this project came to be. The recording process is done, and one of the most amazing albums I've ever heard is now available for purchase. Q: I've heard about the demo tape. Is there anyway to get a copy? A: That's some of the best news Rich fans have received since his death. The Jesus Record will, in fact, be a double CD, and will include a release of the cleaned-up demo tape. The other CD will be a Rick Elias produced recording of Rich's songs performed by the Ragamuffins. They will be joined by guest vocalists on a couple of the songs. A: In addition to lead vocals by Ragamuffins Rick Elias, Mark Robertson, and Jimmy A, the guest vocalists are Ashley Cleveland, Michael W. Smith, Amy Grant, and Phil Keaggy. Also included will be one of those "miracles of modern technology." A demo recording of "That Where I Am, There You..." is enhanced as Rich is joined by the Ragamuffins and the guest vocalists to create one of those songs you could just hear Rich leading us in one of his trademark audience participation rounds. This song is followed by a haunting live recording of Rich playing "Nothing But The Blood" instrumentally on hammer dulcimer from last summer's tour ('97), which closes out the CD. This closing live recording was something Rick Elias wanted to add, assumed existed, but was having a hard time finding a copy until a last minute plea was sent out to the RichMailList. There were many responses, but none of the recordings were quite good enough. Finally, a recording from the 8/10/97 Green Bay, WI concert surfaced, and made it into Rick's hands just in time to be included on The Jesus Record. A: Though a few stores were selling a couple days early (tsk, tsk), the release date is today, June 30th, 1998. A: Yes, it will be distributed nationally. as well as online from the Better Book Room. BBR is offering the double CD, as well as the documentary video ("Homeless Man: the Restless Heart of Rich Mullins"), and song book to Rich Mullins Internet Fans for a discounted price. You may order on the web at http://www.betterbookroom.com/richmullins.shtml, or call BBR in the U.S. at 1-800-678-6119 or at 316-265-4281 from 9-6 Central Time, Monday through Saturday. Please have your credit card information ready. The Better Book Room has been a long time supporter of Rich's ministry. Another resource for The Jesus Record is The Ragamuffin Bookrack. They are also the supplier of the books ("Ragamuffin Gospel", "Orthodoxy", "Cost of Discipleship", and "St. Francis of Assisi") and cool bookmarks that you saw at the merchandise tables on the tour. The Ragamuffins decided to make these books availble on tour, because they were significant in Rich's own spiritual journey and they were the books that he encouraged others to read as he mentored them. The Ragamuffin Bookrack also supports The Legacy, by donating a portion of every sale. They hope soon to have an online resource that allows people to make a literature or music donation that will be sent direct directly to wherever the Legacy feels it is needed. You may contact them on the web page or at questions@ragamuffinbookrack.com or by phone at 888.726.2626. A: Yes, the Ragamuffins and some guest artists took the "Homeless Man Tour" (originally called the "Beyond All This Tour") out in the fall of 1998 in support of the recording. Mitch McVicker and Kid Brothers and This Train were a few of the guest artists that tagged along. The dates were posted to the Dates Page, and includes links to reviews and pictures. There was also be a Spring '99 edition of the tour. The tour officially ended on June 4, 1999 in Tulsa, with one more encore performance in Wichita on June 6th. 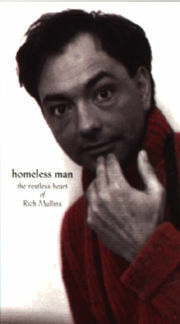 As mentioned above, there is also a video documentary, "Homeless Man: the Restless Heart of Rich Mullins," released simultaneously with the CD. Ben Pearson and Jimmy Abegg filmed footage from the Fall '97 memorial services through GMA week in Nashville in April '98 (at Rich's house outside of town where many of Rich's friends stayed). They traveled from Wichita to Bogota to New Mexico and Arizona collecting video memories for the documentary sponsored by Compassion International and Word. The video includes many interviews and some never-before-seen footage of Rich at a Lufkin, TX concert during the Summer '97 tour. It is an excellent production (have a hanky ready). There is also a song book to accompany the CD, and all of these items (as mentioned above) are available to purchase now at your local resource. There were plans for music videos mentioned, but those plans have yet to materialize. A: Mitch in fact does participate by co-writing a few of the songs (including the #1 single, "My Deliverer"). Mitch also was playing guitar at the recording "session" of the demo on the song "That Where I Am, There You..." along with Rich's guitar. 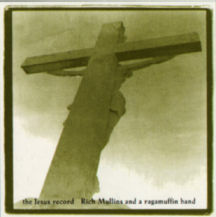 Other than that, Rich wanted The Jesus Record to be a Ragamuffin project (specifically himself, Rick Elias, Mark Robertson, Jimmy Abegg, and Aaron Smith). Last summer, Rich and Mitch had been discussing the need to separate their music and ministry, so that Mitch could begin to develop his own musical ministry identity (sort of get out from under Rich's shadow - so to speak). That was certainly accelerated after the accident. However the primary reason Mitch was unable to participate (even if they wanted him to "sit in") was because he was plenty busy healing. A: Mitch just informed me that in addition to independently releasing his solo CD and touring with This Train this summer, he will also be part of the Ragamuffin tour in support of The Jesus Record. Keep an eye on Mitch's new web page, http://www.mitchmcvicker.com for more information, including how to get a copy of the verylong awaited CD (it's a must have). The World Premiere aired on Saturday, June 6th at 6pm, with repeats at 9pm, and Sunday the 7th at 2pm and 8pm. Each song from the album was played in full. Though there were a few interviews recorded by Bob especially for the broadcast, most interviews were excerpts from the "Homeless Man" documentary video with special guests Amy Grant, Michael W Smith, Mitch McVicker, David Mullins, and others as they introduced the songs. Some have asked if the premiere broadcast will available to purchase. It will not, simply because you will be able to obtain the largest majority of the contents of the broadcast by purchasing the CD and the video. Nationally, Jon Rivers also hosted a radio special made available to Christian stations across the country. The special was to air the end of June 1998, but was postponed by Myrrh, and finally aired by many stations on the weekend of the first anniversary of the accident (Sept 19, 1998). The first single, "My Deliverer," was released to radio on June 12, 1999, but KTLI Light 99 FM began airing two weeks early, with the single's world premiere Friday June 5th at 5pm. They aired the song every hour on the hour that first weekend. "My Deliverer" hit number one in the nation the middle of August 1998 on many charts, including local radio stations, 20: The Countdown Magazine. See CCM Update Online at http://www.ccmcom.com/ccmupdate/98_08_10/charts.html. The next single released was "Nothing is Beyond You," and it also reached the number one spot. See CCM Update Online at http://www.ccmcom.com/ccmupdate/98_11_23/charts.html. 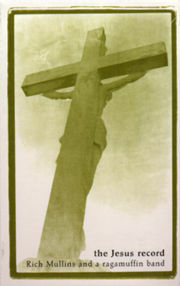 The third single released was "Surely God is With Us" in January 1999. It cracked the top ten on many national charts (see CCM Update Online for March 8, 1999), and as high as number one on some local charts. A: The Light 99 Scrapbook Page at http://www.light99.com/scrapbook.shtml now includes copies of Rich's handwritten lyrics. They have posted full page scans so you can read the lyrics literally in Rich's own words. Also Brian William's fan page, Calling Out Your Name, includes a discography entry including lyrics, sound clips, guitar chords, scriptural references, and even some midi files. You'll find it at http://www.kidbrothers.net/tjr.html. A: Yes. The first such appearance was both versions (the Ragamuffins and Rich's demo) of "My Deliverer" on the RELEASE Audio Magazine cassette, "Rich Mullins - The Song Continues" (now out-of-print). It was a companion item to the August/September 1998 issue of Release Magazine, which had some neat articles and info. You can read those articles online (as well as other Release articles) at Brians William's Calling Out Your Name page. Next is Provident Music Group's latest in the WOW CD series, WOW 1999, which included "That Where I Am, There You ..." on the Green Disc of the two disc set. 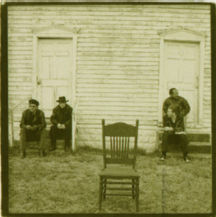 It is advertised as having three bonus tracks, and though those are not listed on the back of the CD cover, they are well documented inside the liner notes. What is not mentioned is that it also includes as a hidden track of what many consider the best cut on the entire Jesus Record project - Rich's boombox demo version of "Hard To Get." You will find it on the Silver Disc immediately following the last song at 4:52 of Track 16. What a wonderful surprise for those who may not have already heard it. The third appearance was actually in the works over a year ago. The three CD's released last week for the upcoming DreamWorks' Prince Of Egypt animated movie include "The Prince of Egypt - Inspirational." Toby McKeehan of DC Talk was approached to do a song for the project, and he had heard "My Deliverer" on Rich's demo tape. He chose that song actually before the Ragamuffins recorded the Jesus Record. The lyrics were slightly modified, and though it's difficult to compare it to the Ragamuffin's version (not to mention Rich's version), DC Talk does a good job with their interpretation. A: On January 27, 1999, the Gospel Music Association announced the nominees for this year's 30th Annual Dove Awards. Rich received (or was involved in) nominations in five total categories, including Song of the Year, Songwriter of the Year, Hard Music Recorded Song of the Year, Pop/Contemporary Album of the Year, and Recorded Music Packaging of the Year. (see [RichMailList 231]) The Dove Awards will be held at the Nashville Arena on Wednesday, March 24 at 8 p.m. (CST), and be delayed-broadcast on dates thru April 12th. For all the details, go to http://www.doveawards.com.